The word "drug" comes from the Dutch "droog" by way of the French "drogue", and means "dried plants". In many ways the history of medicines is the history of humankind's relations to the plant world, extending back through pre-history. Herbs, possibly used for the treatment of intestinal parasites, were found in the personal effects of Ötzi the Iceman, Europe's oldest natural human mummy, frozen in the Ötztal Alps for more than 5,300 years. A 60,000-year-old Neanderthal burial site, Shanidar cave in northern Iraq, has yielded large amounts of pollen from eight plant species, seven of which are still used as herbal remedies, suggesting that at least one of the burial caves was that of a Neanderthal shaman. Plants produce chemicals as a part of their normal metabolism. Some are known as essential nutrients; another class, called phytochemicals, are considered to have medicinal applications that have been continually open to investigation and study. - The Western herbal tradition, as based on Greco-Roman sources. Also recognized are traditional African medicine; Unani-Tibb, a South Asian traditional medicine derived from Hippocates and developed by Arab and Persian practitioners; shamanic herbalism as derived from South America and the Himalayas; and Native American medicine. Each branch in effect works from the same common store of plant elements -- understood in the West as alkaloids, polyphenols, glycosides, and other biochemicals. At the same time, the understanding of the function and very nature of these plant elements can be widely different among the various branches, which in turn can be tied to widely differing views of the human body and its functioning and nature. 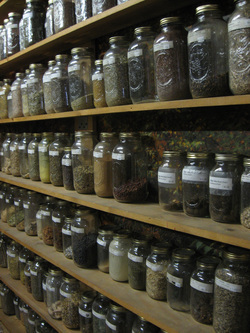 The Chinese system of herbal medicine is the earliest, followed closely by the ayurvedic. The Western herbal tradition is comparatively late, and has been largely superseded by modern chemistry, as the Western paradigm that is Science has come to be the standard by which -- and the filter through which -- the Chinese and ayurvedic are evaluated for their legitimacy. The first written accounts of the use of herbs originate in China. Contents of the Shénnóng Běn Cǎo Jīng, the first Chinese herbal book and a probable compilation of oral traditions, could date back as far as 2800 BCE. A second central treatise, the Shāng Hán Lùn, by Zhang Zhongjing, a physician during the later years of the Han Dynasty, was composed around 200 CE, and is the oldest complete clinical textbook in the world, containing 112 herbal prescriptions. Besides herbal treatments, traditional Chinese medicine also includes acupuncture, dietary therapy, and tui na massage, and is widely practiced throughout East Asia. Chinese medicine views the body more in terms of function than anatomy, and diagnoses are "patterns of disharmony" affecting organ systems. With its categorizations of organs and organ systems along Daoist yin-yang divisions, and its descriptions of energy channels -- meridians -- that distribute life energy and connect parts of the body to each other, the Chinese model of the body is at apparent odds with Western science, and so is considered "alternative" in the Western world. Some researchers trained in both western and traditional Chinese medicine have attempted to rework the ancient medical texts in the light of contemporary science, substituting, for example, pro-oxidant and anti-oxidant balance for the traditional Chinese concept of yin-yang balance. Ayurvedic medicine, similarly widespread in its part of the world, traces its origins to the Vedas, where its earliest concepts are contained in metrical passages that may date as far back as the 2nd millennium BCE. Buddhism has also been an influence on the development of many of ayurveda's central ideas. The Sushruta Samhita, treating all of the major concepts of ayurvedic medicine, is dated to the 3rd or 4th century CE, and contains descriptions of 1120 illnesses, 700 medicinal plants, 64 preparations from mineral sources, and 57 preparations based on animal sources. Ayurveda also focuses on exercise, yoga, meditation, and massage, integrating mind and body. As with Chinese medicine, ayurveda understands human health as being part of complex metaphysical taxonomies that operate within the body, throughout the processes of creation and, indeed, as part of cosmic evolution; and though within Indian culture there is a recognized body of Vedic science, the West will tend to view the Vedas simply as precursors to Hinduism and so primarily as an aspect of religion. Hence ayurvedic medicine is also considered "alternative" in the West. The Western herbal tradition has its written origins in the Greco-Roman era and in the works of Hippocrates and Galen. While Hippocrates advocated the use of a few simple herbal drugs -- along with a basic regimen of fresh air, rest, and proper diet -- Galen recommended large doses of drug mixtures -- including plant, animal, and mineral ingredients. A comprehensive text that remained in use through the sixteenth century was the five-volume De Materia Medica of Pedanius Dioscorides, produced in 65 CE, describing between 500 and 600 plants, along with their medicinal use as oils. The Arabic world in turn copied out tens of thousands of Greco-Roman texts, and Avicenna's 14-volume Canon of Medicine lists 800 tested drugs, plants and minerals, and includes discussion of the healing properties of herbs, including nutmeg, senna, sandalwood, rhubarb, myrrh, cinammon, and rosewater. The second millennium, however, also saw the gradual emergence of chemistry and modern scientific method, and with it the gradual incorporation of the herbal into chemical medicine. Today, pharmacologists, microbiologists, botanists, and natural-products chemists all search the Earth for phytochemicals that can developed for treatment of various diseases. However, while traditional herbalism tends to view any given phytochemical in relation to the others also present in the plant, considering their combined or synergistic effects, modern pharmaceuticals tend toward the isolation of the individual chemical element as medicinally self-sufficient. Also, the capacity to isolate single elements enables the patenting of single compounds as sources of corporate revenue. Western medicine is thoroughly integrated into the Western economic model that powers industrialized economies, and its approach as a curative method is toward short-term health crises that are seen as discrete events. Can a science that is driven by a business model of quarterly returns encompass medical models that treat the totality of a person in relation to the whole of their environment? To the extent that the Western economies dominate, so too do the knowledge paradigms that are part and parcel of them. It is therefore often difficult to fully apprehend non-Western medicine and the larger non-Western cultures from which they derive, seen as they are through the total filtering of Western perception. On the other hand, the prohibitive expense of Western pharmaceutical products in other parts of the world maintains the herbal tradition as a cost-effective alternative, and, with it, the knowledge paradigms that sustain them. Despite such apparent disparities, an underlying unity remains. For example, in a study of 122 active compounds widely used in medicine today, 80 percent showed a positive correlation between their modern therapeutic use and the traditional use of the plants from which they are derived -- which returns one to Ötzi the Iceman, as well as to that 60,000-year-old Neanderthal burial site. Is shamanism simply a branch of anthropology or is it in touch with a view of the totality of nature -- and direct and primal interaction with it -- that the gradual development of human culture has replaced bit by bit with layer upon layer of intermediate filters of perceiving and knowing? One can carry this question even further, back to what is now the realm of biology. How do sick animals "know" to change their food preferences to herbs that they would normally reject? How do they "know" to forage for plants with antiviral, antibacterial, or antifungal properties? How do certain species of birds "know" to select nesting materials with antimicrobial agents so that their young are protected from harmful bacteria? Is the organism itself a living knowledge paradigm? And what then of the world or the cosmos of which it is a part? And what then of those early shamans, on the borderland between humankind as part of Nature and humankind learning to treat Nature as an object of science? What does the living organism within the "human" still know, and how do we restore to ourselves that dormant but ever-present knowledge?